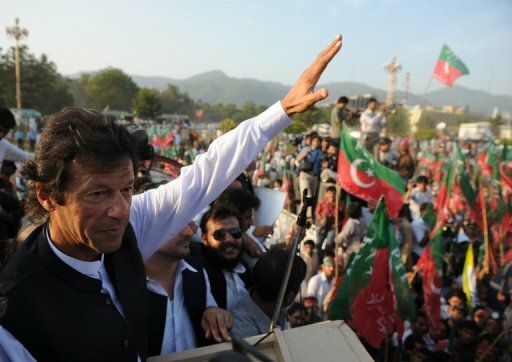 Adnan Aamir: Imran Khan’s Tsunami strikes Quetta! Imran Khan’s Tsunami strikes Quetta! Today, Pakistan Tehreek-i-Insaf's (PTI) political rally took place in Ayub Stadium Quetta. Imran khan coined the name Tsunami for huge number of people turning up in his rallies. This time PTI Tsunami struck the violence wrecked Quetta. PTI supporters are calling it a huge success and change for status-Quo in Balochistan. Imran Khan, as usual made an emotional speech and criticized his political opponents and raised the slogans of change. This was a political activity in Quetta, after a long long time due to the prevailing security situation. The main aim of this rally other than political point scoring was to bring Balochistan in mainstream politics of Pakistan. Now, was it a success, its too early to give a verdict but In my opinion it was successful musical, political show that failed to achieve its objectives. Imran khan was holding this rally to show the world that he enjoys support of people of Balochistan. He also wanted to display the support of public required to solve the problem of Balochistan. Balochistan conflict is Baloch specific. Baloch natives are against the state and they are the ones facing the wrath of the security establishment. Pashtuns, the second biggest community in Balochistan, are not part of this conflict. This rally comprised predominantly of Pastuns and no presence of any Baloch whatsoever. So, by not having support of Baloch how can Imran khan be different from current rulers of the country. Zardari and Nawaz also talk about reconciliation with Baloch insurgents but they don't have public support just like Imran Khan. This rally completely failed to prove this point that PTI has any influence in Baloch population. In his speech, Imran Khan talked about corruption and backwardness in Balochistan but he did not speak about the security situation which is a mess. He talked about missing persons in general and not specifically mentioned thousands of Baloch missing persons. He also did not bring a word out of his mouth about the Kill and dump of Baloch by unknown angels. All these things went on to prove a point that on Balochistan issue he is echoing the voice of establishment. Now, establishment is responsible for all wrong things happening in Balochistan, how can Imran khan bring any change by not opposing establishment? Even Nawaz Sharif has taken a stand against establishment on the issue of Balochistan, although that is limited to making statements only for gaining political mileage. Lets discuss few other things from speech of Imran Khan. He said that when he will come in power, I don't think he can so easily, He will bulldoze the walls of governor houses in entire Pakistan and convert them into educational institutes. I very humble classify it as an overstatement. Any rational person can imagine that this is never going to happen. Imran was just making a political statement by gauging the mood of oppressed masses listening to his speech. PML-N, after taking power in punjab in 2008 made somewhat a similar statement. A new CM office built by ex-CM Pervez Elhai was classified as waste of money and PML-N declared to convert new office into a university. Till today, this promise was not made good. Now they claim that its not possible due to security reasons as a Public university in highly sensitive area can't be safe. They couldn't think this point while making this announcement? Of course they could, but this is how things are managed in dirty game of politics. If Imran khan ever came in power, He will also make a similar excuse for this challenging claim that he has made. So, in short, this was an emotional,irrational, public demanded claim made by Imran during the rally to get more applauses and slogans in his favour. The current security turmoil in Balochistan has apparently made it impossible for any party to carry out political rallies at larger scale. Sectarian killings on daily bases, which are followed by violent protests and strikes and security check posts at every corner have created an atmosphere of fear. This atmosphere is not suitable for any political activity, despite that PTI arguably did a successful political show taday, how? Its very simple, by effective support of state apparatus and most notably para-miliatry force of FC (Frontier Corp). FC provided intense security to entire setup of PTI which includes protection of convoys of people to the venue of rally. There is nothing wrong with that so far, FC is paid for providing security. The problem arises when citizens of Quetta saw FC personnel installing and fixing billboards and banners advertising PTI rally. This is evidence of the collaboration of the establishment with PTI in order to make this rally even possible. This proves two things, Establishment is backing PTI and PTI does not have popular support at large scale as they tried to exhibit in their rally. This means their show of strength is artificial and therefore useless to solve the complex and dire problems in Balochistan. Imran Khan's sudden surge in the political scenario in Pakistan has surprised many political pundits. there are allegations that establishment and specifically ex- chief of ISI, General pasha strongly supported Imran Khan. Despite all that no one can deny the popularity that Imran enjoys in Urban Punjab and Khyber Pakhtunkhaw. That popularity does not guarantee instant political success due to complex dynamics and norms of Pakistani politics. One thing is certain, he has no support whatsoever in Baloch belt of Balochistan and rural Sindh. In fact establishment is imposing him to people of Balochistan so that he can fill the political vacuum created after boycott of elections by Baloch Political parties. He is determined, competent and not corrupt and better than Nawaz Sharif and Zardari, but by playing in the hands of establishment He can attain power for himself but oppressed people of entire Pakistan will get nothing. If free and fair elections are held in Balochistan he can't get more than a couple of seats in Pashtun areas of Balochistan. PTI has no future in Balochistan, provided that bona fide elections are held unlike the last general election of 2008 which was not election but selection, specifically in Balochistan. I would like to wish PTI and all his supporters best of luck while saying that PTI's Tsunami failed to make an impact in Balochistan.